In the past, I have found explaining exactly what Reiki is to be a difficult task and quite frankly, one that made me a little nervous. In the attempt to explain Reiki, I am often caught sounding somewhere between mad scientist and etherial hippy. In the beginning I didn’t know what Reiki was. All I knew was that it felt amazing and its impact changed my life in immeasurable ways; seen and unseen. For me, it has very much been a spiritual journey, but the logical part of myself wanted to understand the scientific principles behind energy therapy. Not only to satisfy my own curiosity, but of those who questioned me about my Reiki practice and the validity of my experiences. 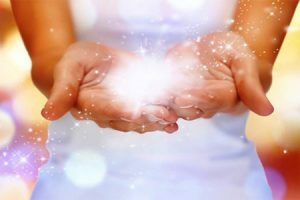 A Reiki treatment and the space it creates for both the practitioner and the patient is difficult to put in a tidy, neat little box but here is a quick explanation and at the very least, food for thought. Reiki science can best be explained by Quantum Physics. Nobel Prize winning physicists have proven that everything that makes up our physical world, from a grain of sand to every cell of our body, is one large physical sea of energy. It can neither be created nor destroyed and we see only a fraction of it based on the limitations of our five senses. According to particle theory, the objects that we see are an ever changing energy field and not solid by any nature, including our bodies. Our bodies are made up of energy down to the minute detail; muscle, tissue and organs are made up of cells. Cells are made up of molecules. Molecules are made up of sub-atomic particles. Particles are made up of energy. These energy particles, that science tells us are infinitely beyond our sphere of perception, are bouncing around at an incredible frequency and vibration, creating our own biomagnetic field. Which, like all energy, can be manipulated and channeled. A siginificant amount of scientific evidence has come to light proving that thoughts have an energetic value as well and can create a negative or positive effect based on its intention. Stanford University professor William Teller’s research proved that thoughts are indeed a form of energy measurable by a device created to detect voltage. Dr. Masaru Emoto, a Japanese researcher, provided an enormous amount of evidence when his experiments focused on water proving that our thoughts can alter its molecular structure and therefore our physical reality. This leaves one to wonder, if our bodies are comprised of 50-65% water, how do our thoughts manipulate our own bio-magnetic field? From this perspective, it is entirely possible that what we think, based on its energetic vibration, can alter our own energetic vibration creating a positive or negative effect or dis-ease within our bodies on the physical, mental and emotional levels. Reiki Science & Quantam Physics: How does it actually work? As Reiki science research gains momentum it largely focuses on the electromagnetic field, pathways and meridians along which this energy travels, and is transferred to and within the body. One of the many wonders of the body includes the The myofascial system which is very much like a super highway that consisits of collagen tubes filled with fluid that carries electrical light impulses called biophotons (biological light). These biophotons, sparks of intelligent conscious energy, carry the very building blocks of life and allow our cells to communicate with one another. They move throughout our bodies constantly by way of our electromagnetic field carrying energy and information along the myofascial highway to all parts of our body. Within this myofascial system are seven major points where there are more concentrated fascia than anywhere else in the body. It is interesting to note that these denser fascia points also coincide with the seven major energy centers Reiki practitioners focus on during treatment, called chakras. Reiki practitioners, through training and meditation, attune their electromagnetic field to the higher frequencies of consciousness energy that exists in and all around us. With this connection to the universal life force we have explored through quantum physics and the loving intention of thought (which we now know is also energy that can manipulate physical reality), the Reiki practitioner can focus this energy to the receiver. The practitioner acts as a conduit channeling this energy through their own bodies, out their hands, and into the patients body and own electromagnetic field. This energy, the intelligience of which we have only begun to scratch the service of, always goes to where it is needed fascilitating healing on all levels. The lack of scientific data in regards to the efficacy of Reiki, is largely due to the lack of clinical trials or laboratory studies. Currently, the are 100 plus triple blind, gold standard studies on energy therapy conducted across the globe have begun to widen our understanding of this healing modality and it’s infinite potential to heal on all levels. Thankfully, those number of studies increase yearly and attribute to the growing use of this energy therapy in hospitals and clinical settings all over the world. Portsmouth Regional Hospital in New Hampshire has provided over 8,000 Reiki treatments since 1995. “The focus of offering Reiki in (our) hospital (is) to bring compassion and humanity back in the patient’s experience. Additionally, at a time when patients can feel passive in their care, Reiki offers a sense of empowerment. By choosing Reiki, patients may actively participate in their healing process” – Patricia Alandydi, Portsmouth Hospital Program. As the popularity of Reiki as a complimentary healing modality to conventional medicine grows, so does Reiki science research. Reiki, when explained from a physics stand point, can seem a bit overwhelming. But the beauty of Reiki energy is that it is inherently at the very core of our existence, therefore incredibly easy to learn. Anyone can do it. You don’t have to possess a spiritual or religious background, nor fully understand its scientific principles. All one needs is a little training and a genuine interest in helping others.